Polygons that are on the same plane can be combined to create a multi-shaped polygon product. Hold Ctrl and click on the polygons that you wish to combine. Right click and select Combine as new Polygon. 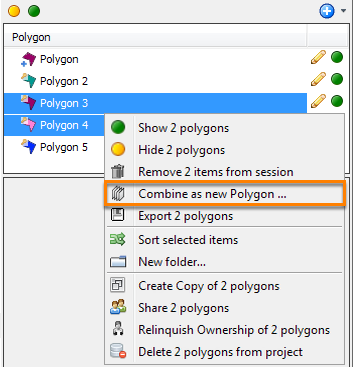 Note: The "Combine as New" option is not available if the polygons are on different planes. 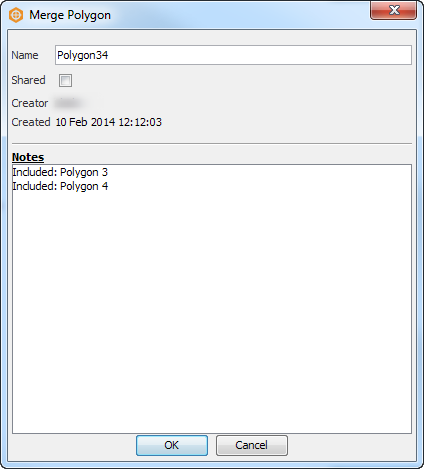 Ensure that polygons have the same time value before combining. Type a name for the new polygon and click OK. Note: The creation of a new merged polygon will NOT replace/remove the existing polygons. To remove the individual polygons, right-click and delete them.